Dear friends and colleagues,I am pleased to announce that the new book which I wrote with Michael Braungart, The Upcycle: Beyond Sustainability—Designing for Abundance, will be published next month. Four years in the making, the book re-joins the conversation sparked by Cradle to Cradle in 2002, one which, I am grateful to say, is as lively and meaningful as ever. Cradle to Cradle is a foundation, a fulcrum against which we can lean levers of desirable change. The Upcycle is a collection of stories about amplifying, scaling up and accelerating change, about discovering those leverage points where innovation tips the world not just toward sustainability but beyond. We believe upcycling the quality of our design—seeking purposeful, continuous improvement instead of simply recycling yesterday’s sub-optimal or obsolete ideas is the force that will raise up a more just, prosperous, fruitful world. President Bill Clinton has done us the great honor of writing a foreword to the book. 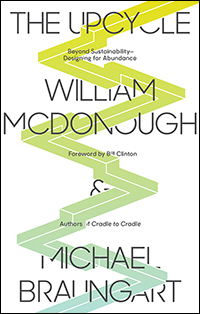 Here’s an excerpt—“The Upcycle is a book about creativity, about thinking big even if we have to act small, and about approaching problems with a bias for action…Bill McDonough and Michael Braungart invite you to think about the future we share; to imagine what could be and how to make it so. We are all in this together, and we’ll need a global commitment to sustainability if we want our children to inherit a world of shared opportunity, shared responsibility, and shared prosperity. Let’s get to work.”Yes, let’s. We are living in a moment of reckoning and extraordinary opportunity, a calamitous time when many businesses are seeking new ways to apply their considerable energy and resources to meeting the world’s needs. Agile, responsive businesses, those able to upcycle everything they do, will create more value for more people. They will prosper, and so will the places and people sharing their beneficial presence. Generosity, abundance and the good health of our world will define success.Please join us on this journey. Let’s upcycle everything.